NIRMAL WEEKLY LOTTERY LOTTERY NO. NR-55th DRAW held on 09/02/2018 - Today Live Kerala Lottery Results:17/12/2018 "Win-Win W-491"
The prize winners are advised to verify the winning numbers with the results published in theKerala Government Gazatte and surrender the winning tickets within 30 days. Kerala Lottery Results of Nirmal Weekly NR-56 as on 9/2/2018 has been published. 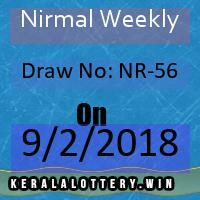 First prize of Nirmal Weekly NR56 is Rs: 70 lacs. . You can see today's Kerala Lottery Results as on Friday, February 9, 2018 . Kerala Nirmal Weekly online result, 09-02-2018 lottery , KeralaLottery Results are also uploaded in video format to Youtube . Subscribe to our youtube Channel at https://www.youtube.com/c/Kerlot . Official pdf of Nirmalweekly is also available for download. Nirmalweekly NR 56 Results of 9.2.2018 can also be seen by downloading our Android App from Play store.